This recipe is suitable for both goose and bronze turkey. Put a good lump of goose fat in a large pan over a moderate heat. Cut onions in thick slices from root to tip and add to pan. Cover with a lid and cook for about 15 minutes until soft. 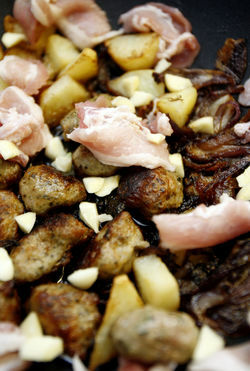 Add the pancetta or streaky bacon, potatoes and the garlic to the onions. Continue cooking until the potatoes start to colour. Stir in fresh thyme, the lemon zest and sausage meat. Cook until the sausage meat has coloured a little. Add the lemon juice and season with salt and black pepper. Remove and place in an ovenproof dish and put into a medium to hot oven for approximately 3/4 hour.